Brandon Stark has been off finding himself for a while on Game of Thrones. OK, OK, he's actually been doing very important work becoming the Three-Eyed Raven. But just what exactly does that mean? What kind of powers does that give young Lord Stark? Before season eight officially begins, let's take a look at everything Bran is capable of. We're pretty sure he's the key to defeating the Night King, we just don't know exactly how it will go down. Using animals is the typical method of warging. In fact, Bran might be the only person to ever warg into a person. It seems to be a dangerous proposition to the inhabitee, as Bran's warging into young Hodor during a vision and Hodor's subsequent death in the future are what led to Hodor's mental break as a young man. Greensight is one of the talents of some Children of the Forest, but some humans can also experience it. Bran is one such human, blessed (cursed?) with this ability that lets him see past and present events without having to be there - this is firmly established, as we just saw him travel back in time to witness Rhaegar Targaryen's wedding to Lyanna Stark and he also recently is able to witness Littlefinger threatening his father, Ned, back in season one, which he brings up during Littlefinger's trial in the season seven finale. Bran's greensight first shows itself in season one, when he has a prophetic dream about his father, Ned, being executed at King's Landing. Jojen Reed later explains to Bran that this is, in fact, greensight, which the Children of the Forest are known for. It is at this point in season three that Bran really starts to realize he might have extraordinary powers. Now, we know Bran the ability to warg and the power of greensight before meeting the Three-Eyed Raven. But once they meet, the Three-Eyed Raven trains Bran in how to harness his powers and take over as the Three-Eyed Raven. This means instead of just being some boy with a few mystical powers, Bran is now kind of the guardian of these powers. Presumably, he will hold the Three-Eyed Raven post until such time as he dies an old man, when he will have trained a new Three-Eyed Raven to take his place. 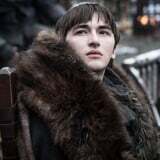 What's interesting is that with the former Three-Eyed Raven's guidance, Bran is taken to specific past events that help him learn important lessons or glean important knowledge for the events of present day. But now that the former Three-Eyed Raven is gone, Bran is kind of casting about at random when it comes to pivotal events. Case in point: Bran doesn't know Rhaegar and Lyanna were married until his conversation with Samwell Tarly tips him off and he goes back in time to witness it. Nor does he know to look into Littlefinger's dealings until he and his sisters start conspiring to bring Littlefinger down. There is some debate as to whether Bran can also see the future. He has definitely seen flashes of future events in his visions, like in his montage of quick glimpses in season six, episode six. As this slow-mo video shows, Bran sees the explosion of the Great Sept of Baelor four episodes before it actually happens. However, that doesn't necessarily mean Bran can just look into the future like a fortune teller and see all the events unfold - because if he could, why hasn't he done that already? It feels more like Bran can get flashes of events, almost like prophecies, rather than full-on knowledge of the future. It is also unclear if Bran can warg into a person who is at full mental capacity. Now, this does get into the rules of time travel a bit - Bran's warging into Hodor is what caused Hodor to have his mental break. But when Bran wargs into Hodor, it's in season six and Hodor is already "simple minded," even if it is Bran's warging that causes that to happen to young Hodor. Trippy, right? But either way, Hodor is not at full mental capacity when Bran wargs into him, so we don't yet know if Bran could take over someone who perhaps has the mental abilities to fight off being warged into - we're sort of imagining an Imperius Curse situation, where someone could throw off the warging if they fought hard enough. The question is: Is Bran powerful enough to warg into the Night King?